AND, since I am FAR from Scholarly, but Love to read and share…Here are excerpts, quotes, and videos for you all to enjoy! God Bless You and May Our Blessed Mother Always Protect and Guide Us. AND, that She may Continue to Intercede for Us to Her Most Glorious Son, Our Lord and Saviour, Jesus Christ. Madre Gloriosa, Santísima Virgen Maria, Ruega Por Nosotros. By contemplating Mary in heavenly glory, we understand that the earth is not the definitive homeland for us either, and that if we live with our gaze fixed on eternal goods we will one day share in this same glory and the earth will become more beautiful. Consequently, we must not lose our serenity and peace even amid the thousands of daily difficulties. The luminous sign of Our Lady taken up into Heaven shines out even more brightly when sad shadows of suffering and violence seem to loom on the horizon. We may be sure of it: from on high, Mary follows our footsteps with gentle concern, dispels the gloom in moments of darkness and distress, reassures us with her motherly hand. Supported by awareness of this, let us continue confidently on our path of Christian commitment wherever Providence may lead us. Let us forge ahead in our lives under Mary’s guidance. Now at the end of the summer season, the Church celebrates the most glorious “harvest festival” in the Communion of Saints — Mary, the supremely blessed one among women, Mary, the most precious fruit which has ripened in the fields of God’s kingdom, is today taken into heaven. The idea of the assumption of Mary into heaven after her death is first expressed in narratives of the fifth and sixth centuries. 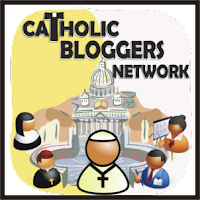 Even though these were never official, they bear witness to the very early belief in a teaching of the Catholic Church which was not formally defined as a dogma (a teaching essential to the Catholic faith) until 50 years ago. Though it was almost universally believed for more than a thousand years, the Bible contains no mention of the assumption of Mary into heaven. The first Church writer to speak of Mary’s being taken up into heaven by God is Saint Gregory of Tours (594). Other early sermons on the Feast of Mary’s entry into heaven are those of Ps.-Modestus of Jerusalem (ca. 700). 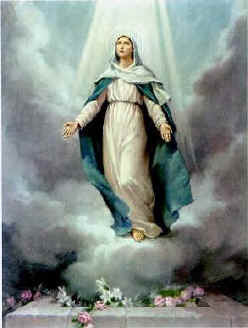 On May 1, 1946, Pope Pius XII, asked all bishops in the world whether they thought this belief in the assumption of Mary into heaven should be defined as a proposition of faith, and whether they with their clergy and people desired the definition. Almost all the bishops replied in the affirmative. On November 1, 1950, the Feast of All Saints, Pope Pius XII declared as a dogma revealed by God that “Mary, the immaculate perpetually Virgin Mother of God, after the completion of her earthly life, was assumed body and soul into the glory of Heaven”. We have no real knowledge of the day, year, and manner of Our Lady’s death. The dates which have been assigned to her death vary between three and fifteen years after Christ’s Ascension. Both Jerusalem and Ephesus claim to be the place where she died. (By tradition, Mary lived at Ephesus after the death of Jesus.) Mary’s tomb was presumably found in Jerusalem. It is believed that Mary died in the presence of all the Apostles, but that after her burial, her tomb, when opened, was found empty. Therefore, they concluded that her body had been taken up (assumed) into heaven. Saint Gregory of Tour provided a rationale for the tradition, which is related to her having been preserved from original sin. He said that it is inconceivable to think Mary’s sinless body, likened to the Ark of the Covenant which was made of incorruptible wood, should decay in the grave. The text, ‘Rise thou and the ark of thy strength’ (Ps 132/1:8) was understood to mean that it was God’s will that, as Christ had ascended, so too Mary would be received into heaven. In Catholic countries the Assumption of the Blessed Virgin Mary is one of the most popular festivals of the year. The increased number and splendor of paintings of Mary’s assumption into heaven from the late sixteenth century onwards, in which Mary appears as “a woman, adorned with the sun, standing on the moon, and with twelve stars on her head for a crown” (from the description in the Book of Revelation 12:1), attests the depth of popular devotion to this manifestation of divine grace bestowed on the Mother of God. The theme of the heavenly coronation of the Blessed Virgin as Queen of Heaven, often represented paintings and sculpture, is related to her being assumed into Heaven where she reigns next to her Divine Son. The Feast of the Assumption has always been loved dearly by the faithful who are children of Mary. It is a sign to us that someday, through God’s grace and our efforts, we too may join the Blessed Mother in giving glory to God. The Assumption is a source of great hope for us, too, for it points the way for all followers of Christ who imitate her fidelity and obedience to God’s will. Where she now is, we are meant eventually to be, and may hope to be through Divine grace. Mary’s being taken to heaven after her life on earth was ended is the logical outcome of her immaculate nature, uniquely protected — also by God’s grace — from personal sin. We seek to imitate her self-sacrificing love, her indestructible faith and her perfect obedience. For Christians, death is not extinction, though, unlike Mary, all ordinary mortals, even the most faithful Christians, the saints, must await the Second Coming of Christ and the general Resurrection to receive our “glorified bodies”. May we see heaven as our goal and come to share her glory. [We seek to] attain to the unity of the Son of God, to mature manhood, to the measure of the stature of the fullness of Christ; so that we may no longer be children, tossed to and fro and carried about with every wind of doctrine, by the cunning of men, by their craftiness in deceitful wiles. Rather, speaking the truth in love, we are to grow up in every way into Him who is the head, into Christ, from whom the whole body, joined and knit together by every joint with which it is supplied, when each part is working properly, makes bodily growth and up builds itself in love. It is a custom in many coastal regions in the US and Europe to have special blessings of the water – the sea or ocean – on the Feast of the Assumption. The custom originated in 15th century Italy, when a bishop traveling from Venice, during a storm at sea on the Feast of the Assumption, prayed and threw his pastoral ring into the sea from the ship — and the waters were calmed. In the US, these celebrations take place annually in Atlantic City, Camden, Long Island, and in other coastal cities and seaports along the eastern seaboard. In some of these “blessings of the sea” celebrations, after the priest or bishop has blessed the water, the people wade out into the water and fill bottles with it, and apparently use it like regular holy water. The celebration in Atlantic City is called the “wedding of the sea”, and part of the ceremony is the bishop (or priest) throwing a wreath of flowers and a ring from a boat into the water, symbolizing the union of the city and the sea. A similar blessing and “wedding” is an annual event in European coastal cities — and especially Venice, where it is, understandably, a celebration of longstanding tradition.